Before you dig out your flapper dresses and suspenders, odds are this is a party you can’t afford to attend. 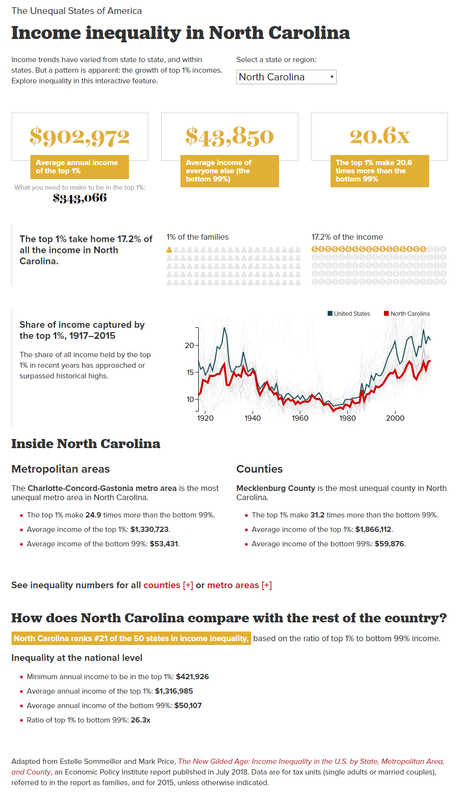 A new report from the Economic Policy Institute shows that the level of income inequality in the United States and North Carolina has increased over the past several years to a point where we are now at or above the economic divide that helped to propel the world in the worst economic collapse in modern history. We’re not doomed to repeat the Great Depression, but it is clear that state and federal policy in the last several years has failed to address the single most pressing economic challenge of our time. Instead of hoping that more tax cuts for wealthy people and profitable corporations will magically fix our problems, it’s time for leaders in Raleigh and Washington, D.C., to admit that we are reaching levels of inequality that threaten the social and economic fabric of our country. Patrick McHugh is an Economic Analyst for the Budget & Tax Center, a project of the NC Justice Center. Thanks for proving that teachers are at the bottom.